This reserve-status class was once in the forefront of early coreward and spinward advances, accounting for a reported 60% of the contacts made with new civilizations. Known from its introduction for its speed and maneuverability, the Type 1 was found only to be lacking in the power of its weaponry. By Stardate 1/8707, the Type 3 is known to have been introduced, and, by Stardate 1/9902, the Type 1 no longer existed in the fleet. The S-3 underwent internal changes that did not effect the overall performance of the vessel until the Type 8 was introduced about Stardate 2/0000. 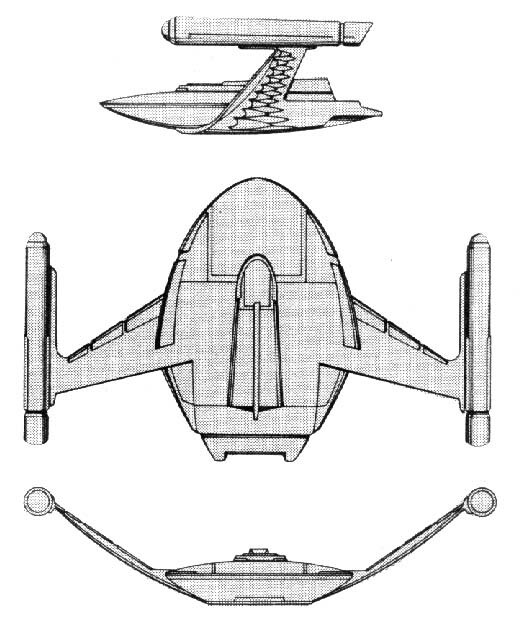 This new type mounted more powerful engines and weapons than earlier versions; the overall warp speed was increased. The final modification to this class was the Type 11, introduced about Stardate 2/0910; this version had an impressive array of weapons and an upgraded shield system. At this time, all vessels of this class are believed to have been removed from active duty. Of the nearly 800 Vessels constructed, about 400 were placed into reserve status and about 200 are assumed to have been lost. Most of the vessels sold are being used as light transport, though several are being used for private research; of the 176 vessels known to be operating in the civil sector, two are Type 11s and frequent the Triangle. The class is named from the RomuIan revastal (free flight), a reference to its speed and maneuverability. Power Units Available – 9 ea. 9 ea. 10 ea. 11 ea.